The International Development Finance Club (IDFC) is a CEO-led network of 20 leading development finance institutions with mandates for national, sub-regional, regional and international activities around the world. Its chairman is Dr. Ulrich Schröder, CEO of KfW, the German development bank. The 20 IDFC members have total assets of more than US$2,000 billion (World Bank Group: US$576 billion) with their total commitments adding up to approximately US$430 billion (World Bank Group: US$53 billion). 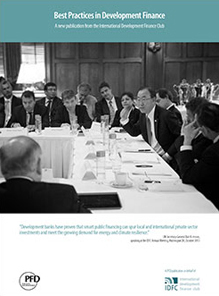 In 2013, PFD was selected by the members to produce the first publication for the International Development Finance Club. The publication contains a focus on the IDFC working groups including sustainable infrastructure, energy efficiency, renewable energy, social and economic inclusion, and sustainable urban development. UN Secretary-General Ban Ki-moon, who had attended the Second Annual Meeting of the IDFC, provided the report’s introduction. The CEOs and Presidents of all members were interviewed by PFD’s team to present their bank’s vision for the IDFC alongside case studies reflecting the programmes of the individual members. Enter your details to read this publication online. Congratulations to you and the team for the great job.